Can You Make Your Own Tarot Cards? So you've decided you love Tarot, but you can't quite find a deck that resonates with you. Or perhaps you've found some that are okay, but you really want to tap into your creative spirit and make a custom deck of your own. Can you do it? Sure! Making your own Tarot cards is a great opportunity to express your hobbies and interests in a creative way. Use images that resonate with you personally, but be mindful of copyright issues. You can buy blank cards, pre-cut, and create your own designs on them as you wish. Why Make Your Own Cards? One of the marks of being an effective practitioner of magic is the ability to make do with what's on hand. If you don't have something, you find a way to obtain or create it, so why not think outside the box? After all, people have made their own Tarot cards for ages, and all of those commercially available decks had to come from someone's ideas, right? Many people have made Tarot cards throughout the course of the centuries. You can purchase blank ones in a set, already cut and sized for you, and create your own artwork to go on them. Or you can print them out on photo paper or card stock and cut them yourself. The very act of creation is a magical one, and can be used as a tool for spiritual growth and development. If there is a particular hobby you have, or a skill you enjoy, you could easily incorporate these into your artwork. An important thing to remember is that images on the Internet are often copyrighted, so if you want to use them for personal use, you may be allowed to do so, but you would not be able to sell them or reproduce them for commercial use. If you have any doubt about whether an image may be legally copied for personal use, you should check with the owner of the website. There are a number of websites on which people have made their own Tarot designs available for free to anyone who wishes to use them. For instance, if you're a knitter, you might find a way to draw a deck using knitting needles for swords, balls of yarn for pentacles, and so forth. Someone with an affinity for crystals could create a deck using different gemstone symbolism. Maybe you'd like to make a set of cards involving your children's school drawings, or try mapping out a deck with photo stills from your favorite television series. 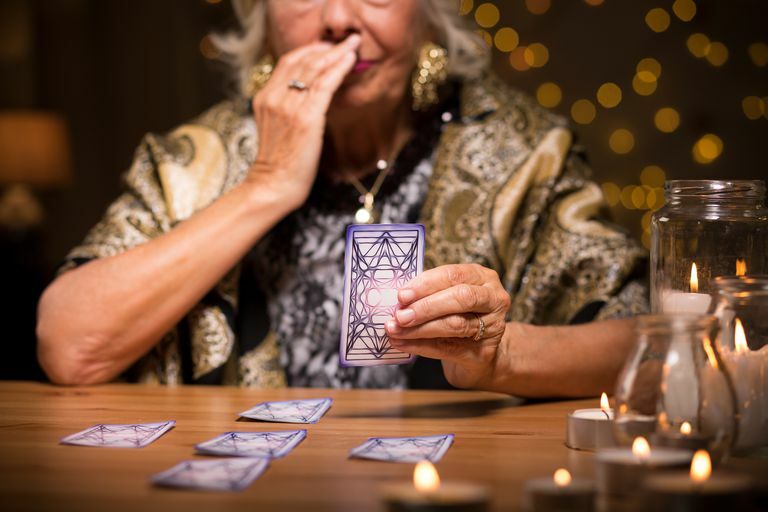 A few people have created decks that they saw as filling a gap in traditional Tarot imagery, such as a lack of gender and cultural diversity, or one that specifically meets the intuitive needs of you, the reader. "Every once in a while when the weather is bad and I can't get out on the bike, I work on my deck that I'm designing just for my personal use. The Coins are represented by Wheels, and the Swords are kickstands. For the Major Arcana, I'm sketching out people that are recognizable in the biking world. It's taken me years just to get halfway through the deck, but it's a labor of love, and it's something just for me, and not to share, because the artwork is stuff that matters to me but probably wouldn't to anyone else." Ideally, what you'll want to use is images that resonate with you personally. If you just don't feel a connection with the traditional image of a wand, for instance, use something else to represent that suit — and do it in a way that makes things meaningful to you. It's also important to remember that you don't have to be a professional artist to create a deck of Tarot cards — use images and ideas that matter to you personally, and you'll find you like the end result. "If you get stuck, think about the things in your life that “feel” magical and spark something inside of you. This could include nature, sacred spaces (in your environment or in the world), magical tools you use in your rituals, shapes, people you admire, characters from books, musicians, affirmations to keep you motivated, food, quotes or poetry... Don’t be afraid to edit meanings as you get to know your cards more. This should be a fun, fluid process. Don’t overthink it." If you'd like to learn more about the Tarot, be sure to check out the Intro to Tarot Study Guide to get yourself started!